Built for the United States Army Corps of Engineers as No 1968, and sent to the UK under Lend-Lease. Stored at Newbury Racecourse. 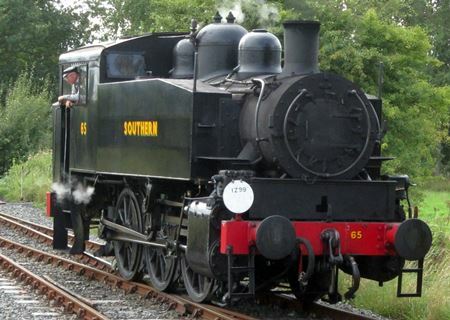 One of fourteen purchased by the Southern Railway and sent to the Melbourne Military Railway for running in. Entered service with the Southern Railway in November 1947 as USA Class number 65. Renumbered 30065 by British Railways. Worked at Southampton Docks. Withdrawn, and entered Departmental service as DS237 at Ashford Wagon Works. Withdrawn in April 1967 and sold to Woodham Brothers, Barry, Wales in March 1968. Developed a hot box en route and dumped at Tonbridge. Sold to K&ESR in August 1968 and delivered the next month. Remarks Shunting engine designed for the United States Army Transportation Corps. After WW II used in various countries, among which France, Geece, Iran, China.